I received compensation of getting free tickets for reviewing this website. All opinions are my own. Do you like bidding on travel like hotels, vacations deals, and even rental cars to save extra money on your vacation getaway? How about being able to bid on concert tickets, sports tickets, and even amusement park tickets to get great savings? Well guess what folks, I found a website that you can save up to 60% on every ticket, everyday, guaranteed! You want to know about my great discovery? 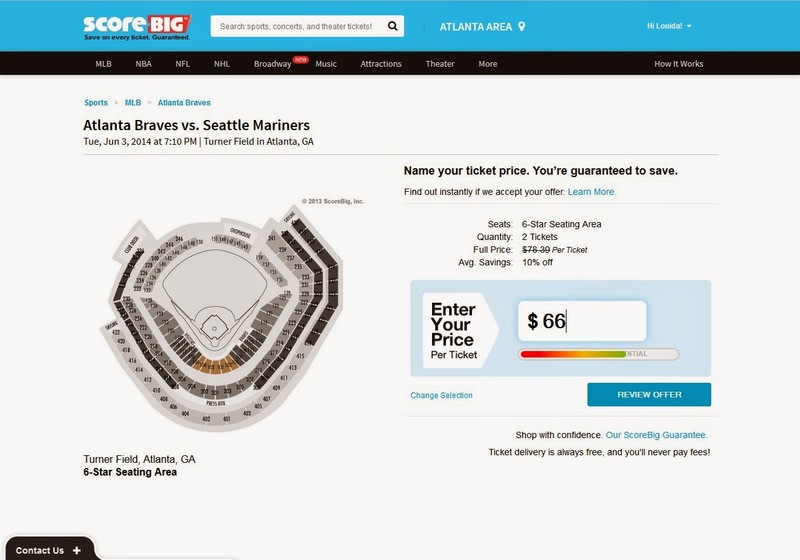 The website is called Scorebig.com and you can save on sports, concert, and theater tickets without ever paying any fees or shipping charges for the privilege. Around 40% of live event tickets go unsold every year - even for events you think are "sold out". That's a lot of empty seats! And the ticket industry can't offer big discounts on some seats and not others in a way everyone sees. So to get those seats filled they give them to ScoreBig, which allows them to pass on those huge savings directly to you! Tell them what you want to pay - you have all the control, it’s thrilling! 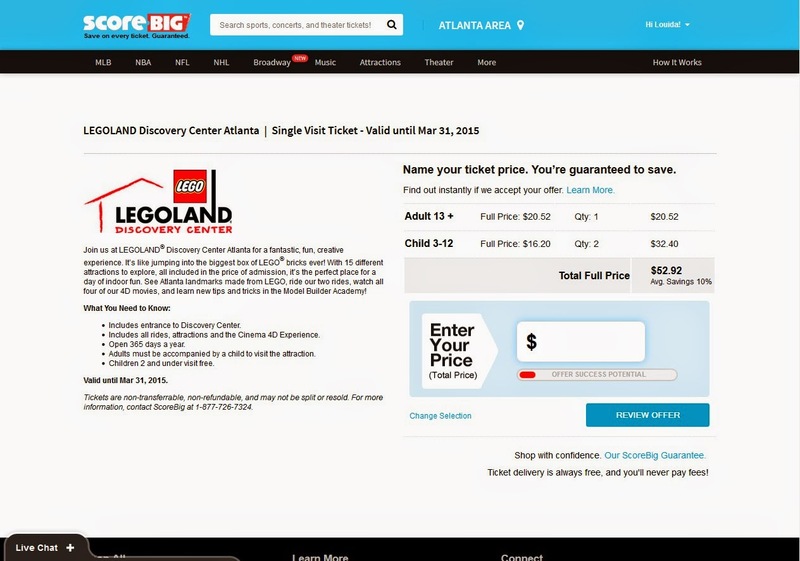 While I was browsing through the website in the Atlanta section to find attraction tickets for my daughters and I, I came across Legoland Discovery Center had available tickets. I been wanting to take my daughters back to Legoland because they now have a new attraction we haven't been to yet. I searched for tickets for the three of us and the fix price was $52.92 total. Now you know I wanted to save a bit of money, so I chose to make an offer. At first I didn't understand how the bid meter works ( when the meter goes to green when you enter your bid your offer more than likely will be accepted ) and I entered a bid of $40.00 and the meter was still on red so my offer was declined. When this happens you can't bid again on the same tickets until after 24 hours has passed. Also, it will show you the average savings will be for the tickets and for these tickets it was an average savings of 10% off. The next day after 24 hours has past, I tried again but bidded higher. This time I offer to pay $50.00 and my offer was immediately accepted! BOOYEAH! I received an email from ScoreBig with my order information afterwards. In the FAQ section of the email, it told me my tickets would come in either 3 different ways: Will Call, Postal Mail, or Electronic E-Tickets. I had to wait for another email to let me know how my tickets would arrive. Since I did this on Memorial Day weekend, it took about 3 days to get an Delivery Notification email from ScoreBig to let me know my tickets were shipped through FedEx and they gave me the tracking number. Follow me on Instagram to see our visit to Legoland once we go. The best seating of course would be 6 Star since you're right at the very bottom. The concept is the same, you either pay the fix price or you make an offer. The more empty seats that needs to be filled, the more savings you can get. 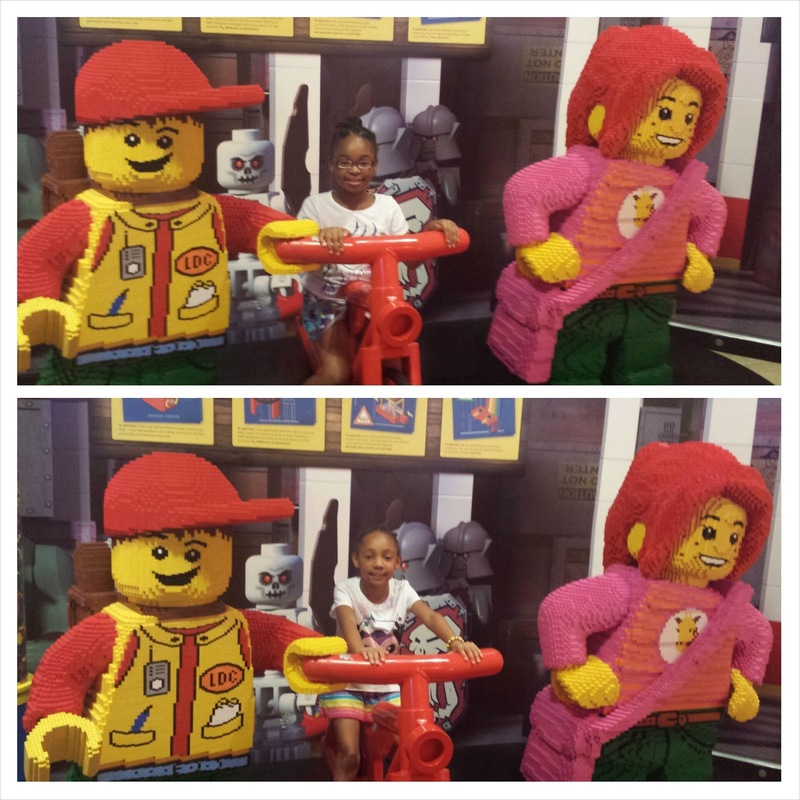 UPDATE- My family and I attended Legoland with no problem using the tickets from ScoreBig. Is ScoreBig.com Worth a Try? This website is great! I always love being able to save money! I'm always bidding on my vacation travels so now I have the option to bid on entertainment tickets too. No wonder ScoreBig has been recently recognized by Forbes as one of America's Most Promising Companies and by Billboard as one of the 10 Best Start-Ups of 2012! Have you ever used ScoreBig.com before? Disclosure- I received compensation of receiving free tickets to review this website. All opinions are my own. Sounds cool! I don't really like bidding but I know it can be worth the time especially for sports events I'll check this site out thanks for sharing! I don't really attend sporting events but since this website has attraction tickets in Florida, I will definitely use their website. I wasn't really interested in the sports but then I seen travel attractions and now I am very interested lol. I am checking it out right now! Yes check out the website and start bidding on attraction tickets! 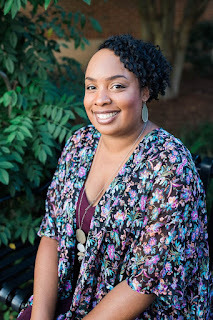 We love sports and travel attractions so I'm definitely checking the site out! Thanks for sharing! You're welcome Alli! I hope you enjoy! Girl, he would love this website! Scorebig will really help us save money on all our fun summer activities this year! I'm excited to hear about it! ScoreBig sure will help you save on some summer activities! It sounds like it's a great way to save a little money and lord only knows how much Red Sox tickets cost here in Boston! Ouch! I bet those tickets are expensive! You got to be a die hard fan to pay those prices! That sounds neat! I'll try to keep it in mind next time I need it. I will have to mention this to my husband.. and we will have to study it.. Love that it includes events and they don't charge you for bidding. Yeah, no fees what so ever! It's a great website Aimee! Yeah check it out and see if you can find more affordable tickets. WOW! never heard of this!! I get nervous about buying from second hand dealers that I have never heard of but if you tried out and the tics were legit then I will check it out! thx! Yeah you'll need to try out ScoreBig Nadeen, they are a legit company. Ooooo!!! This is great! I have been wanting to get hubby tickets for some games this summer. Now I know where to look for a good price! I'm so happy you found ScoreBig.com. You sound so excited and like you are getting so much use out of it. It's contagious. I'll have to take a look! Yes I'm excited to learn about this website! I think you'll enjoy ScoreBig Courtney. I'm all for cutting costs whenever possible. This sounds like a great way to do so. This is neat! we can bring the kids to entertainment without breaking the bank. Thank you for sharing! I like the concept! And, I've never heard of score big before, i'm headed to check them out even more! Thank you, Louida!! I need to check Score Big out because I love saving on going to attractions and when we occasionally decide to go and see sporting events! Check it out, it is a great website! I'm always here for a deal! I love getting great deals!